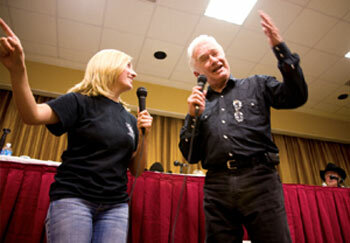 Western Film Festival Photos--Memphis 2012, page 1 (gallery 15). 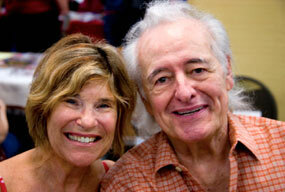 Sandy and James Taylor welcome you to “A Gathering of Guns 4”. 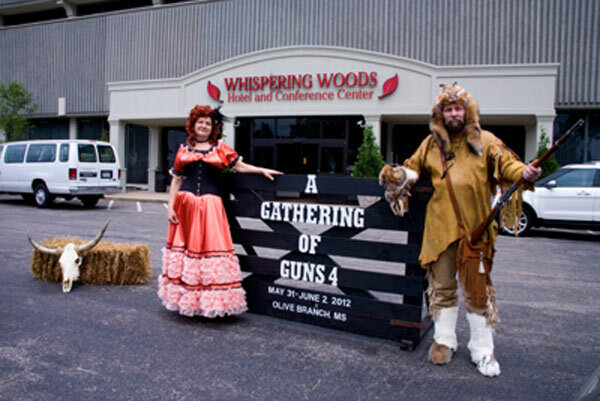 Photos from “A Gathering of Guns 4—A TV Western Reunion” at the Memphis Film Festival, co-sponsored by WESTERN CLIPPINGS, May 31-June 2, 2012, at Whispering Woods Hotel and Conference Center in Olive Branch, Mississippi. The stars of “A Gathering of Guns 4” at the Memphis Film Festival. (Top row l-r): Gary Clarke (“The Virginian”, “Hondo”), Bobby Crawford (“Laramie”), Johnny Crawford (“The Rifleman”), Veronica Cartwright (“Daniel Boone”), Diane Roter (“The Virginian”), Jeff Connors (son of Chuck Connors), Roberta Shore (“The Virginian”) and husband Ron Frederickson, Clint Walker (“Cheyenne”), Rex Allen Jr., Charles Briles (“The Big Valley”), Don Quine (“The Virginian”), Ed Faulkner (character player/heavy in dozens of movies/TV shows), Darby Hinton (“Daniel Boone”). 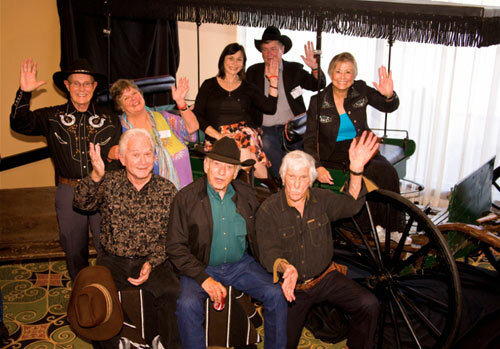 (Middle row l-r): author Holly George-Warren, Johnny Western (“Have Gun Will Travel”), Sara Lane (“The Virginian”), L. Q. Jones (“The Virginian”, “Cheyenne” and heavy in hundreds of shows), James Drury (“The Virginian”). 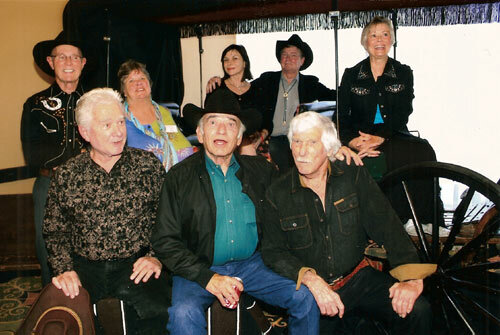 (Front row l-r): Maxine Hansen (Autry Entertainment), Henry Darrow (“High Chaparral”), John Buttram (Pat Buttram's nephew), Hugh O'Brian (“Wyatt Earp”), Randy Boone (“The Virginian”, “Cimarron Strip”), Don Pedro Colley (“Daniel Boone”), Bobby Clark (“Casey Jones”). Here’s the staff that brought you “A Gathering of Guns 4”: (l-r in the Surrey) Felicity Bonello, Bea Quindlen, Donna Wilmeth, Mary Olsen, Donna Brisbin, Carol Ann Kellum, Packy Smith. (Front row l-r): Alex and Dottie McCollum, Donna and Boyd Magers, Ray and Donna Nielsen, Bonnie Boyd. 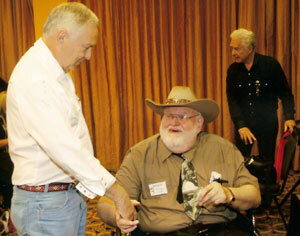 The stars and the co-sponsors say Hi and hope you’ll be back for “A Gathering of Guns 5” June 6-8, 2013. 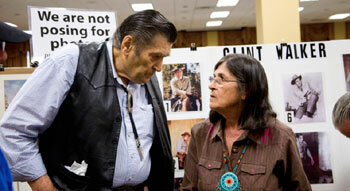 Clint Walker’s fans are legion. 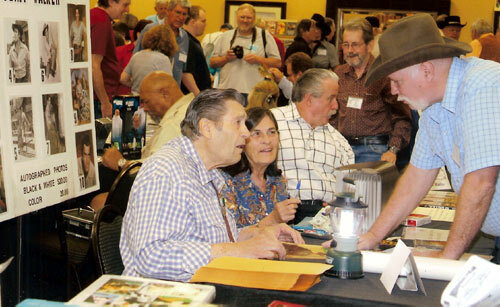 Sharing memories of Fess Parker and “Daniel Boone” were Don Pedro Colley (Gideon), Veronica Cartwright (Jemima Boone) and Darby Hinton (Israel Boone). 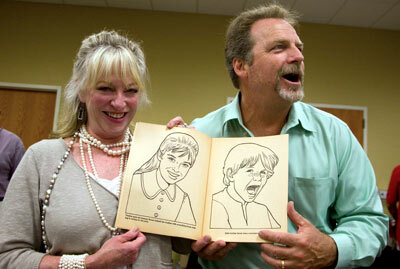 Veronica and Darby recreate their likenesses seen in a ‘60s “Daniel Boone” coloring book given to Darby at the festival by photographer Steve St. John. 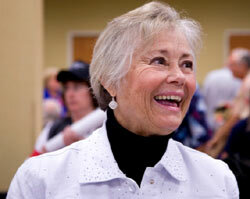 Roberta Shore, Betsy on “The Virginian”, is a delight wherever she goes. This was the 50th anniversary of “The Virginian” and we gathered eight members of the cast together: (Top row l-r): Don Quine, Sara Lane, Diane Roter, Randy Boone, Roberta Shore. (Front row l-r): Gary Clarke, James Drury, L.Q. Jones. The cast of “The Virginian” surrounded by The Virginian Posse who turned out for the 50th anniversary of the series. (Front row l-r): Chris Braning, Ron Frederickson, Roberta Shore, James Drury, Karen Lindsey, Kelly Lucey,Pamela LeBaugh, L. Q. Jones. (Second row l-r): Jeff Mullins, Jan Glass, Nell Moore, Jennifer Glass, Sharon Klopfenstein, Patricia Prior, Sue Ketcham, Barb May, Jeannie Pugn, Randy Boone. 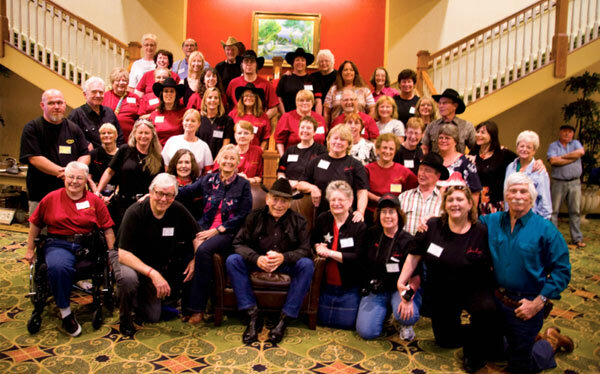 (Third row l-r): Gary Clarke, Stephanie Landry, Mikki Shade, Sharon Schuman, Debbie Johnson, Susan Proctor, Don Quine, Tina Edmonds, Leta Burns, Sara Lane, Diane Roter, Betty Watkins. (Fourth row l-r): Alice Kunreuther, Sharon Landry, Lyn Beiler, Brad Schuman, Terry Bryant, Jeanne Irvine, Renee Jensen, Debbie Wilson, Terri Watson. (Fifth row l-r): Jeanette Wriston, Lynne Mercer, Jerry Klopfenstein, Lynn Kvalheim, Nic Fewer. Standing off to the right of the photo is Patie O’Sullivan. 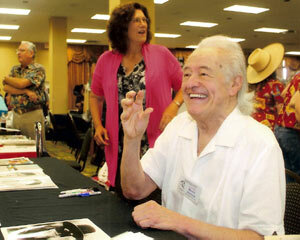 Henry Darrow, Manolito on “High Chaparral”, sold 110 copies of his autobiography HENRY DARROW: LIGHTNING IN THE BOTTLE. His co-author Jan Pippins stands beside him. 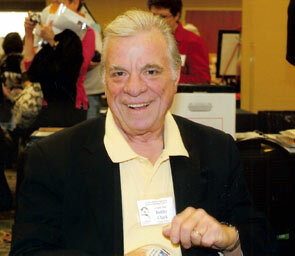 Bobby Clark was Casey Jones Jr. on “Casey Jones”. 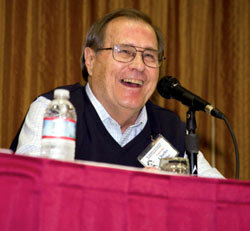 Although usually a bad guy, Ed Faulkner is one of the good guys as he attends one of our six panel discussions. Saturday panel discussion with (l-r) Hugh O’Brian, Ed Faulkner, moderator Ray Nielsen, Charles Briles and L. Q. Jones. 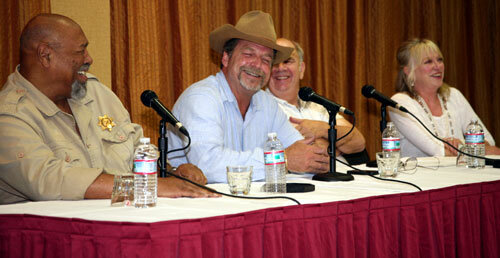 Charles Briles, Eugene on the first season of “Big Valley”, is having fun at a panel discussion. 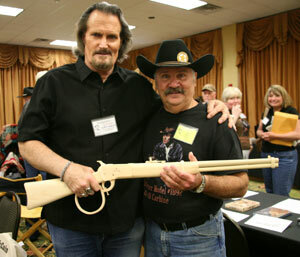 The Rifleman’s real son, Jeff Connors, holds an expertly crafted wooden replica by Stan Wilson (right) of Chuck Connors’ rifle from “The Rifleman”. 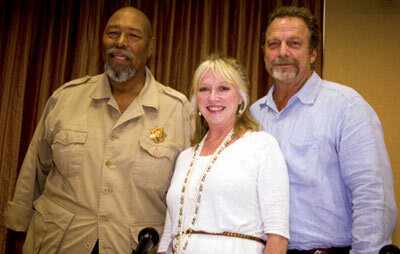 Don Pedro Colley, Darby Hinton, moderator Ray Nielsen and Veronica Cartwright on the Thursday morning panel dedicated to “Daniel Boone”. 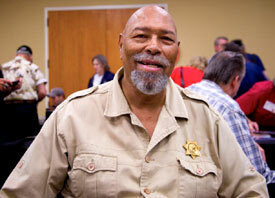 Don Pedro Colley delighted fans with stories of his career. 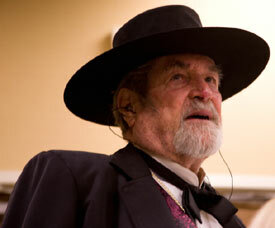 Hugh O’Brian will always be “Wyatt Earp”. 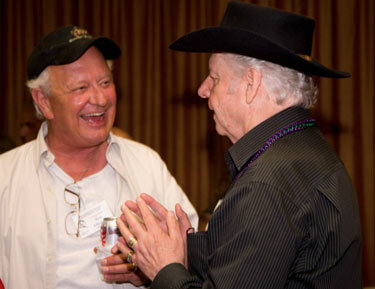 Old friends Rex Allen Jr. and Johnny Western. 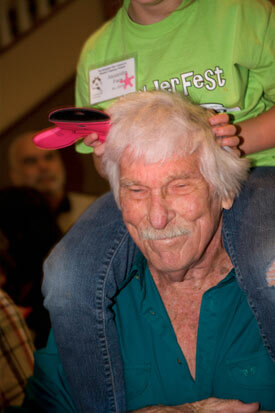 Who else but the delightful L. Q. Jones would allow kids a piggyback ride? 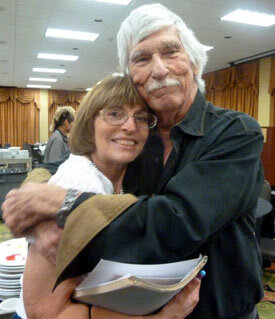 ...and Donna Magers says he gives good hugs too. 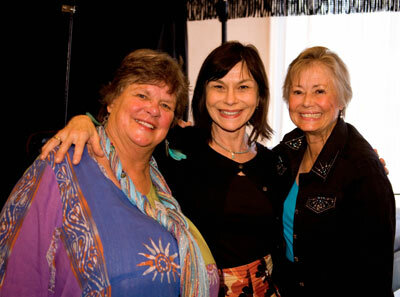 The ladies of “The Virginian”: Sara Lane, Diane Roter, Roberta Shore. Prior to the “Virginian” panel Boyd Magers auctioned off a beautiful quilt made by Donna Wilmeth who holds it for the audience to see. 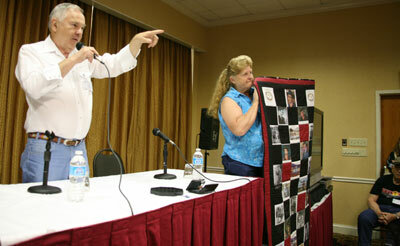 Donna Wilmeth graciously made five quilts which were auctioned off at various panel discussions and at the banquet. 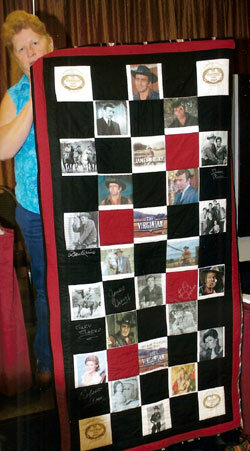 This quilt was dedicated to “The Virginian”. 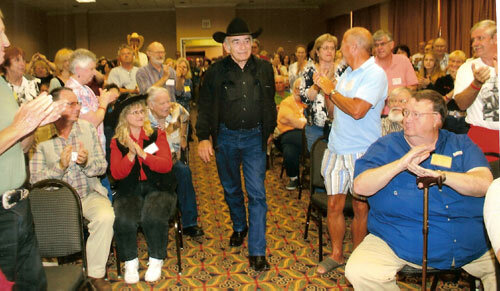 “The Virginian”, James Drury, proudly enters the panel discussion room to resounding applause. 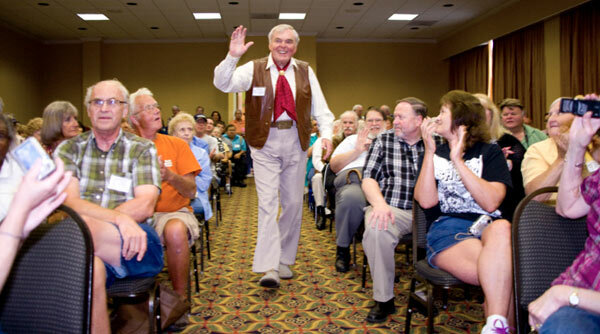 Eight cast members of “The Virginian” celebrated the 50th anniversary of the series. (l-r) L. Q. Jones, Don Quine, Gary Clarke, moderator Boyd Magers, James Drury, Roberta Shore, Diane Roter, Sara Lane, Randy Boone. 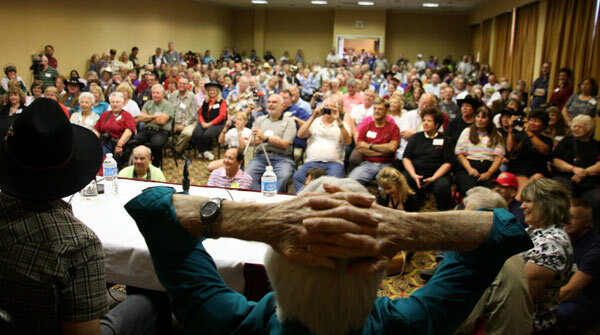 It was standing room only at “The Virginian” panel. Gary Clarke and his daughter Ava perform Abbott and Costello’s “Who’s on First” routine as well as the comedy duo ever did. 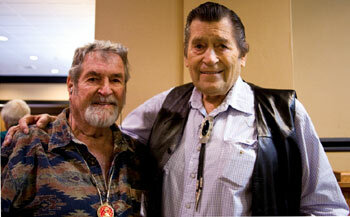 Two western icons—Hugh (“Wyatt Earp”) O‘Brian and Clint (“Cheyenne”) Walker. 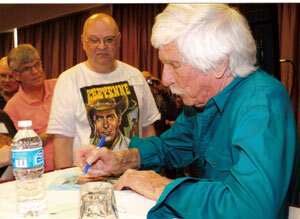 The ever gracious L. Q. Jones signed autographs for free. Boyd Magers presents a $100 first prize to Trivia Contest winner Larry McLane, who also receives a free one year subscription to WESTERN CLIPPINGS. More photos on page 2, 3.